Real estate services company Howard Hanna has taken a big step toward making its services more accessible to its culturally diverse customer base. The company announced this week that in July, its estimated 10 million web pages became available in 100 different languages. 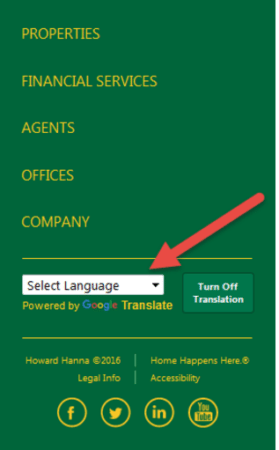 Users can select their preferred language by scrolling to the bottom of the HowardHanna.com homepage and choosing from the pop-up menu. Whether you live in a Paris palace or a coastal tiki hut, an Ohio suburban townhouse or a loft overlooking Madrid’s Plaza Mayor — the concept of “home” instilled in the human consciousness is relatively universal. It’s constant. Comfortable. Always familiar. But in the real estate industry, helping consumers find the house that makes home a reality sometimes requires breaking down communication barriers. The third largest privately held real estate company in the U.S., Howard Hanna, has taken a big step toward more accessible services for its culturally diverse customer base. RE company Howard Hanna’s website now translates in 100 languages. The company announced this week that in July, its estimated 10 million web pages became available in 100 different languages on HowardHanna.com. Screen shot of Howard Hanna marketing material to promote website language translation. In 2016, Howard Hanna’s website has received visitors from more than 200 countries, the company said, and maintains an average of 1.4 million visitors per month. Howard Hanna’s multi-cultural services also extend to the offline world. As explained by the company’s Director of Regional Public Relations Elizabeth L. Grepp, “Technology really can’t work without people, so in our local offices we have agents who specialize in helping families or individuals who are non-native English speakers. Screen shot of HowardHanna.com homepage language menu. Editor’s note: This story has been updated to reflect the addition of Howard Hanna’s mobile site translation feature in September 2016.